Small 1 inch diameter geodes from Mexico. Bitaba birds are not real, but geodes are real rocks. Geodes are rocks that are plain on the outside but can have beautiful crystals on the inside. In the Greek language, geode means "shape of the earth", and geodes are round like earth or oblong like an egg. They can be a couple inches or several feet in size. The geodes in the pictures below have been cut open to expose their beautiful insides. Amethyst geode, 8 inches wide. Celestite geodes, 3.5 to 4 inches in size. Druze quartz lined geode, 6 inches wide. 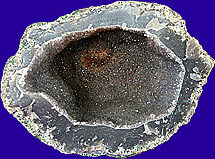 Geodes are created in the hollow areas of soil such as animal burrows or tree roots. They are also formed in the bubbles in volcanic rock. Over time, dissolved minerals seep into a hollow area and harden into an outer shell creating the geode. The minerals continue to form on the inside walls of the shell, growing towards the center. The most common dissolved mineral is quartz, but amethyst and other minerals are also found. It can take hundreds of millions of years for the space inside a geode to be filled, and many geodes remain partly hollow. A geode which is completely filled with crystals is called a nodule. Agate-filled nodules are called thunder eggs. 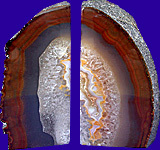 Agate slices from Brazil, 3.5 to 3.75 inches wide. Geodes can have many colors depending upon the type of crystal. 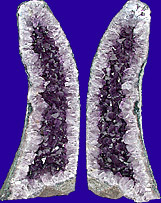 Purple is a typical color for amethyst. Because crystals have flat, clear surfaces with many facets, they reflect light and have a beautiful sparkle. Geodes are found throughout the world, and many are concentrated in deserts. Volcanic areas are a common place to find geodes. In the United States they can be found in California, Arizona, Utah, Nevada, Illinois, Missouri, Kentucky, and Iowa. In fact, the geode is Iowa's state rock. You can buy a small 2-inch geode for a couple of dollars. Large geodes with amethyst crystals can be worth $1,000. Double-chambered geode from Brazil, with pale amethyst in the top cavity, and quartz in the bottom cavity. 13 inches tall. Agate bookends, 5.5 inches tall. Matched pair of cathedral amethyst geodes, 27 inches tall. Photos courtesy of Pisces Trading Company at www.bestcrystals.com.